Global Randomizer and Default, with the ability to save you own Default preset. 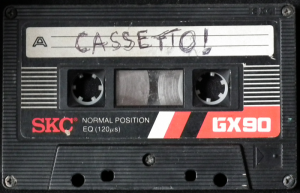 IMPORTANT: You must have the full version of Kontakt 5.6 to use Cassetto or Kontakt 5.5 to use Micro Cassetto, they will not load in earlier versions. They will also only work for 15 minutes in the player. Added 2 Global Randomizer Modes that are more suited to Pads, you can select which is used by the Global Randomize Button on the Advanced Page. Added a Global Randomizer Mode that is suitable for Leads. 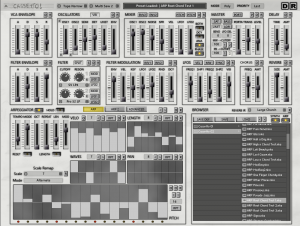 Added 3 Morph Randomizer Modes that Morph the sound away from the current Settings. Fixed an issue where Legato and mono became non selectable. Added Mute Buttons to Oscillators, these are temporary and reset when Cassetto is reloaded. They are used for isolating an oscillator when sound designing. 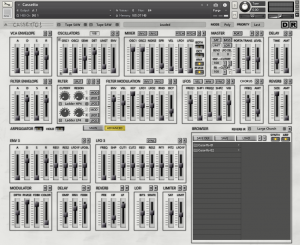 Added 16 Mod sequencer Modes to the Arp. These make use of the Pitch, Cutoff, Resonance, Decay and Release Sequencers without triggering any notes. It means that these sequencers can be used whilst playing notes normally. Added a Menu for the ARP Modes which makes selecting easier and the selected mode can always be seen. 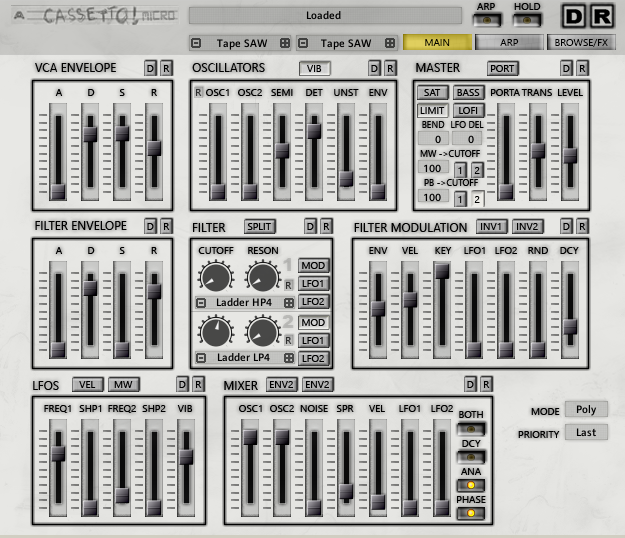 Added Randomize Waves on Load Preset – An interesting alternative when scrolling through the Presets. Replaced the loaded Wave displays with menus so that they can be selected via the menu as well as the slider and -+ buttons. Added a Microtonal Engine that loads Microtonal presets through the existing browser. Ability to intelligently map scales of less than 2 octaves to 12 note mappings so that they make more sense on a standard Keyboard. Support for scales up to 88 notes in size. Support for Scales that span multiple octaves in total range as well as the more common 1 octave interval scales. Added an online facility to convert most Scala (.scl) Files to Cassetto format. Length Mode for the ARP Chord Modes that only triggers new notes if they are not already playing, using the length slider can create some interesting rhythmic results, and can be automated. 3 Root Modes for the ARP where the Root note decides the Key and Scale that all other Notes pass through. Each Sequencer now has a Repeat Button which will cause each step to repeat x times before moving on. The Repeat Time is set by the Repeat Slider which previously only affected Pitch. 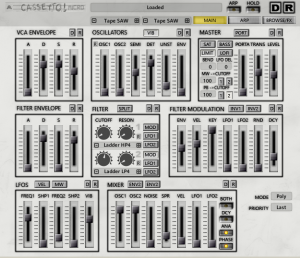 Added Modulation Sequencers to the ARP for Filter 1 & 2, Resonance 1 & 2, Filter Decay and Volume Release. Percentage Knob for controlling the overall level of the Modulation Sequencers. 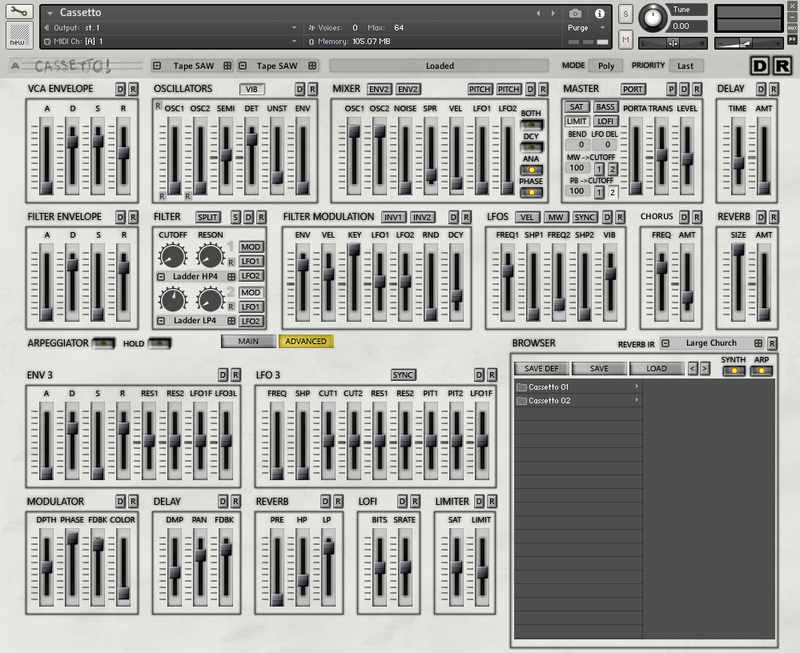 Added ENV3 with destinations for Resonance 1 & 2, Filter 1 & 2, LFO1 Frequency and LFO3 Level. Some sliders can now have negative values so that 0 is the centre, a black mark at the centre of the scale shows this.